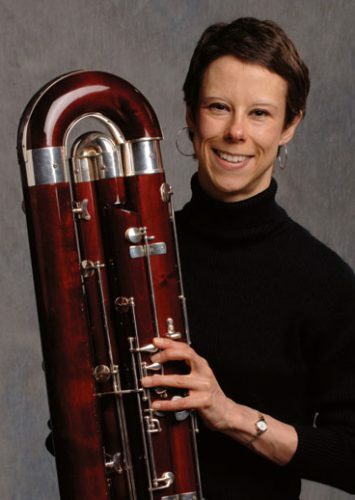 Born in Sorel-Tracy, Québec, Sophie Dansereau discovered the bassoon after several years of work at the piano and the flute. This new opportunity led her to obtain the highest honor of the Conservatoire de Musique du Québec, the “Prix avec Grande Distinction à l’unanimité” in bassoon and chamber music, as well as a Master of Music from Yale University. Her main teachers are Richard Gagnon, Frank Morelli, Christopher Millard and Stéphane Lévesque. Currently contrabassoonist and assistant principal bassoonist of the Vancouver Symphony, Sophie performed, among others, with the Auckland Philharmonic Orchestra (New Zealand), the New World Symphony, the Québec Symphony, as well as several festivals. She has been awarded many prizes in major competitions, and was featured as a soloist on many occasions. A sought after bassoonist in chamber music, she is a founding member of the Ad Mare Wind Quintet, renowned for their musical involvement in Vancouver and their eclectic repertoire. Sophie, who had received the Governor General Award for best Academic in 1992, has served on the faculty of VAM and UBC, and is a faculty member of the West Coast Amateur Music Society.